The invoice price & true dealer cost are not the same. The true dealer cost of a Kia Sorento is lower. The invoice price has Holdback and other hidden markup built into the price. Knowing the true dealer cost gives you needed leverage when it comes time to negotiate a great price. Negotiate from the cost up and not MSRP down. ... These free services will offer you the lowest prices. Note: The Kia Sorento pricing report below does not include rebates or incentives. View Kia Rebates and Incentives. Kia Sorento Prices - How Much is a Kia Sorento? These services will offer you the lowest prices and supply you with multiple competing price quotes. You will know the best price before you visit the dealer. The 2019 KIA Sorento is an amazingly full-features mid-size SUV for the money. Folks are going to appreciate the versatility of the remarkably quiet and cozy cabin, as well as the addition of a third row for more family space than ever before. In some ways, it's the ideal family SUV: Not too big, not too little, not too flashy, but not too plain, and a remarkable value in terms of getting all you pay for and then plenty more. In 2019, the Sorento is taking on an all-new look and features a healthy amount of new features. The V6 engine of the 2019 KIA Sorento will be accompanied by an all-new 8-speed automatic transmission for smoother transitions and increased efficiency. This is a breath of fresh air for the brand that has at times neglected the finer-tuned aspects of performance. Not anymore. This year, there's a 3.3-liter V-6 engine in place of the discontinued 2.0L engine, and drivers will be rewarded with a steadfast 290 horsepower and 8-speed automatic transmission for improved performance and power. Improved design makes for a more handsome and rugged Sorento as well, with brand new LED headlights for a flashier look and more sculpted features to make the Sorento stand out more in a crowd. Trims include the L, LX, EX, SX, and SXL. The base model has a 2.4L engine that gives you a healthy 185 horsepower. A 10-Way Power Adjustable Driver's Seat comes standard on the EX and LX (V6 model). 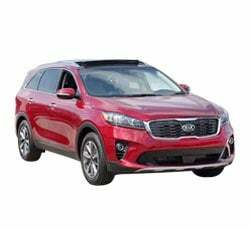 The 2019 KIA Sorento seats 7 passengers and features impressive specifications for head and legroom, for an interior drive that is not only quiet but comfortable. And as a Top Safety Pick, this one features some of the most advanced standard and optional safety features in the world today, and that's something anyone would be proud to have in a family SUV. With practical safety features like advanced airbag systems, rollover sensors, and then Seatbelt pretensioners, you've got just one menu of safety features. It goes on with Stability control, traction control, and side-impact door beams to form one of today's most advanced safety systems. Thanks to the V6 ramping up the power on the KIA Sorento, you're going to be working with a lot more juice out there on the road, and this is definitely a relief for folks who weren't pleased with Sorento performance in the past. You've got a brand new 8-speed automatic transmission for smoother transitions as you drive and much more balanced ride out there on the road. The third-row seating sometimes can throw off a mid-size SUV, but not this one! The 2019 KIA Sorento remains steady as she goes out on the road and for an SUV of this size, it's not heavy on gas mileage either. You'll get a combined MPG of between 21 and 25 MPG on the road, and that's a breath of fresh air for a three-row SUV. Fuel economy is very important to most customers these days, so it's one thing to keep in mind if you're interested in something other than a compact SUV. A mid-size SUV like this can give you a great balance between power, presence, and fuel economy, saving you dollars along the way and letting you travel further in this comfortable SUV. Finally, driving impressions of the new KIA Sorento remain mostly positive, as people were impressed with the softness of interior materials and overall comfort and pleased with the addition of the 8-speed automatic transmission that ramped up performance in this one. Overall, people report that driving the 2019 KIA Sorento is a pleasant experience and affords one the opportunity to get decent fuel economy out of a three-row SUV without having to go full-size and wonder where it's going to be okay to park. Anyone who is in the hunt for a new mid-size SUV would be foolish to overlook the Sorento. It has done its homework for 2019, done away with features that didn't work, added features that dazzle, and come with a whole new look for the year that makes it more stylish and impressive to behold than ever before. In short, it's a home run in the mid-size SUV market. Example: Base Kia Sorento invoice price + the dealer Invoice price of all the options + destination - Holdback = Total Dealer Cost. What is Holdback? A hidden amount that manufacturers give back to a dealer. It is a percentage of the MSRP or the Invoice price. Note: All Kia Sorento MSRP, invoice and dealer cost dollar figures above are approximate amounts. Prices are subject to change without notice. A note about rebates: Most rebates are subtracted from the "on the road" figure. In most cases, you can have the rebate if you are arranging your own financing or you are paying cash. If you decide to use the manufacturer’s low interest financing, you do not usually get the rebate. Ask your dealer for details. Find the Best Deals in Your Area. They Compete - You Win! See who has the lowest price & save.